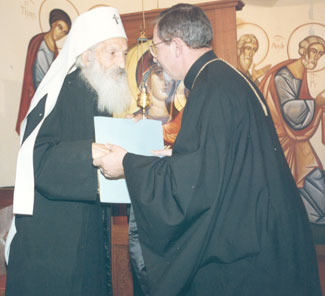 In 1992, then seminary dean Protopresbyter Thomas Hopko (right) conferred an honorary Doctor of Divinity degree upon Patriarch Pavle of Serbia (left), who reposed in the Lord Sunday, November 15, 2009. Yonkers, NY - The community of St. Vladimir's Seminary solemnly marked the repose of Patriarch Pavle (Paul) of Serbia on Sunday, November 15, 2009. With the chanting of the funeral hymn "Memory Eternal" following the Divine Liturgy, worshippers remembered the 44th Patriarch of the Serbian Orthodox Church and his courageous actions as the spiritual leader of Eastern Orthodox Serbs from 1990 until his death—especially his peacemaking efforts during the Yugoslav Wars. The patriarch spoke without notes at the ceremony. He naturally referred to the conflict then raging in Bosnia-Herzegovina. He said that he was convinced that peace could come to the former Yugoslavia only when people would relate to each other as they did in his former diocese of Kosovo, and proceeded to tell how an Albanian Moslem would come daily to his cathedral to pray before the relics of a Christian saint entombed there, believing it to be a holy place where the one God was to be worshipped. God alone, the patriarch said, could bring peace to the former Yugoslavia with its deeply engrained memories of brutality and blood. Without God, he insisted, every effort for justice and unanimity would inevitably fail. Patriarch Pavle had come to the United States in the fall of 1992 to preside over the healing of a schism among the Serbian Orthodox churches in North America caused by certain conditions during the communist era. Healing such divisions became his highest priority when he assumed the office of primate, and peacemaking was the hallmark of his life. Prior to his election as patriarch, Pavle had served as bishop in Kosovo and Metohija for thirty-four years. St. Savva, the prince-become-archbishop who established Christianity in Serbia, had founded his diocese in 1219. The Kosovo region—the "cradle" of Serbian Christianity and national self-identity—includes the ancient patriarchal see of Pec, the place where the Serbian patriarch has traditionally been enthroned. The patriarch's full title was His Holiness the Archbishop of Pec, Metropolitan of Belgrade and Karlovci, Serbian Patriarch Pavle. Upon his death at age 95, Patriarch Pavle was the oldest living leader of an Eastern Orthodox Church. Due to poor health, he had spent his last years in the Military Medical Academy in Belgrade, while Archbishop Amfilohije of Cetinje, metropolitan of Montenegro and the Littoral, carried out his duties. At least forty days must pass after the patriarch's death before a successor can be elected. Meanwhile, the Holy Synod of the Serbian Orthodox Church will hold the authority of the patriarch, while Metropolitan Amfilohije will serve as acting head of the church. The entire community of St. Vladimir's Seminary prays for our departed father in Christ, Pavle. Memory Eternal!